Description Match three or more lights, in any direction, and don't let the grid fill up! 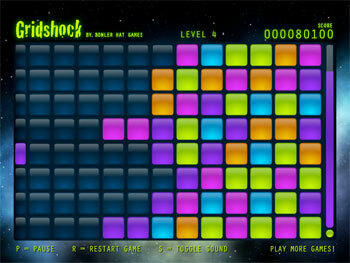 Simply click each row on the grid to activate new lights. Keep the grid from overflowing by matching connected lights in groups of three or more. Control the tide as the timer fills up and new columns are activated automatically. Get big cascading combos for the maximum possible score and a maybe even place on the leaderboard! Match a set of three or more adjacent lights to clear them from the board. A set of matched lights need not appear in a straight line. Players can earn more points by creating multiple matches at once. Click a row with the mouse to activate a new light. Alternatively, use the up and down arrow keys to navigate the rows and the spacebar to activate a new light. Cool, just like AstroPop! Nice graphics.